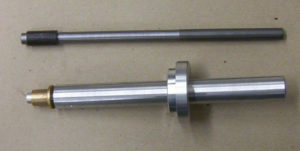 racing the early hemi Chrysler, Dodge or DeSoto, these tools can pay for themselves in a few trips to the machine shop. How about at the track? If you’re hundreds of miles from home and you lose the bushing you’re done – pack it up for a two-bit item. I’ve lost two – that’s why I made the tools shown above. The kit includes: removal bar with sleeve, installation driver and centering guide, one bushing, storage case and complete instructions.